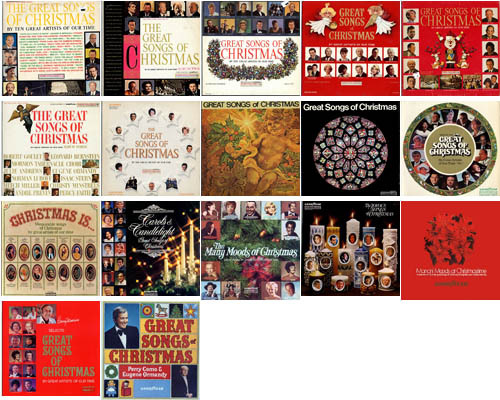 Goodyear Tires Stores released 17 LPs of Christmas music from 1961 to 1977 and were available only from their stores. The compilations were put together by Columbia Records for most of the series, except for the last few produced by RCA. The LPs contained Christmas songs from the Columbia stable of performers, and most were from holiday releases from the artists, although a few may have been special recordings for the series. These LPs featured both Pop and Classical artists, and were a staple on the stereo for many families during the holiday season. These compilations have never been released commercially, since they were produced by the Special Products division of Columbia and RCA. Fortunately many of the tracks on the LPs are still available, and there are some current compilations that have similar selections to these great records. Of course, you can still get copies of the originals at eBay or local stores like Goodwill from time to time.